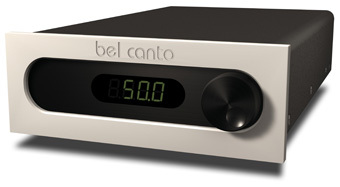 In size, fit, and finish, Bel Cantos attractive e.One Dac3 24-bit/192kHz digital-to-analog converter ($2495 USD) resembles the e.One preamplifier and monoblock power amp. As an exemplar of simplicity, its a delight to operate. The Dac3s front-panel knob and remote control duplicate a brief range of options. If, for example, youre operating the Dac3 in Variable Output Mode -- in other words, as a DAC with a volume control -- the Dac3 comes out of Standby in Soft Mute. Youll never startle guests or yourself. Further, at a volume index of "65.0," the volume-up function continues slowly, again as a hedge against surprises. Good ergonomics. In Fixed Output Operating Mode, which youd be using with a preamp -- and only with a preamp -- the volume is set to its maximum of "100.0" on the display screen. AES, S/PDIF-BNC, S/PDIF-RCA, USB, and TosLink comprise the Dac3s digital inputs. The transport I used was that of my reference Integris CDP, a Philips CDM-Pro, which, absent the Integriss own processing circuitry, transmits at a plain-Jane 16-bits/44.1kHz. I used the S/PDIF-RCA digital cable Bel Cantos John Stronczer recommended, a 75-ohm Stereovox XV2. I have Bel Cantos e.One REF1000 monoblocks on hand, but preferred to evaluate the Dac3 with the amps I normally use, a pair of NuForce Reference 9 SEs. As an ensemble, the NuForce amps, Wilson Audio WATT/Puppy 8 speakers, and Nordost Valkyrja speaker cables and Valhalla balanced interconnects provide, among other pleasures, superb resolution. Were the Dac3 to fall short in this or any other respect, Id be bound to hear it. My three power cords, Aurum Acoustics version of the Cardas Golden Reference, are committed to the Integris and NuForce amps. I used a Crystal Cable Reference AC cord for the Dac3. "Ultra-Clock combines a low-noise, optimized, fixed-frequency crystal with an advanced DSP clock synthesizer/filter to generate a specific clock frequency at the output. Each clock is programmed to extreme frequency accuracy, and the DSP filtering keeps short-term frequency changes, or jitter, to extremely low levels. The sonic result is greater soundstage presence, image size, and dynamic expression: just about everything that makes high-performance audio compelling." Rather than prattle on about a thoughtfully designed components innards and operation, Ill cut to what they pay me for: decide whether Stronczers claims are the kind of hype to which weve long been inured, or a reasonable description of what the e.One Dac3 actually does. A New Yorker cartoon of many years ago: In full-page color, a spectacular Grand Canyon vista at sunset. A couple stands at an observation railing. The man says to the woman, "Too much purple." This fastidious fellow would be quite the perfect audio journalist. No matter how good the object of his attentions, a top-drawer scribbler will always discover too much purple -- somewhere, anywhere! Aspiring to my dodges élite, the only criticism I can think to level at the Dac3 addresses the latter half of its designation as an "Audio DAC/Preamplifier." While the product includes an obviously excellent and subtly stepped volume control, there ends its "preamplifier" aspect. We high-end audio dweebs have long since disdained tone controls -- including, of course, "Presence" controls and similar lowbrow bling -- as Satans handiwork. However, a balance control is desirable, particularly in a room that is something other than symmetrical. I find myself using the Integriss balance control more often than not. (Though when I use the Integris as a transport only, its balance function is inoperable.) If you operate the Dac3 with a preamp -- and remember, only with a preamp do you put that rear-panel button in its Fixed Output position! -- the need will be provided for. That niggle discharged, I struggle against sounding like a love-smitten teen. Im also casting about for a characterization of a superb audio component that will misstate neither its qualities nor those of the unit against which I compared it. And they are a wee bit different. Going back over this paragraph, it occurs to me that against which reads as a touch more aggressive than with which, and yet these comparisons are, by their nature, struggles to the death. For the audiophile, any observation about less than stellar performance sinks the product reviewed like a stone in a lake. Aurum Acoustics Integris CDP lists for $12,000. Thats expensive, even here in Global Audiophilia. Having it go head to head with a component that sells for a tick less than $2500 is, on the face of it, a stretch. If we take into account the Dac3s relatively modest price, it becomes a most attractive combatant. I prefer nevertheless to base my assessment in terms other than an audio items place within a budget. I see no need. And here it would be timely to mention that I continue to regard the Integris CDP as the best player Ive ever heard. Early one morning when the world was quiet, I listened to the profoundly beautiful middle movement, Andante ma non troppo e molto cantabile, of Beethovens String Quartet 14 in C-sharp Minor, Op.131, as performed by the Aurum Quartet, going back and forth between the Integris CDP and the Bel Canto e.One Dac3. (The recording is part of a two-CD set, Tacet 130, that also includes the Aurums performances of Quartets 13 and 16.) Theres nothing quite as revealing of detail, timbre, dynamic finesse, and soundstage dimension as a good recording of two violins, viola, and cello. Another quality I thought I detected via several discs established itself in a most agreeable way: The Dac3 was a shade warmer than the Integris CDP, a characteristic that imparted, to strings in particular, an attractive luminescence and a somewhat airy and velvety texture. And -- the best news yet -- this was accomplished with no diminution of resolution or transparency, or indeed any curtailment of the high strings topmost harmonics. It was all there, handsomely packaged. Clearly audible differences between the Bel Canto and the Integris were a little harder to confirm when the musical forces were greater in number. A recent arrival Ive played several times, Monteverdis majestic and magical Vespro della Beata Virgine of 1610, with Paul McCreesh conducting the Gabrieli Consort and Players [Archiv 00289 477 6147], features vocals, from solos to ensembles, with organ and period-instrument accompaniments. In keeping with the musics spiritual mission, I had something of a secular epiphany by way of the Dac3 when the strands of a particularly complex vocal passage stood out as if individually lit. Another recent arrival Ive been listening to, a four-disc set of symphonies by Ferdinand Ries [CPO 777 216-2], who served for a time as Beethovens secretary, rounds off our itemization. Here it became more difficult still to determine differences. Rather than go out on an untrustworthy limb, Ill state for a certainty that, within their spacious venue, Zürichs Neumünsterkirche, Howard Griffiths and the Züricher Kammerorchester provided me with a whole lot of pleasure. I was especially impressed by the Dac3s way with re-creating the space and instrumental detail in this recording. Did I prefer, overall, my Integris CDP? Was it a smidgen better at microdynamics and resolution? I answer with a resounding "Perhaps!" -- but Im not at all sure Id want to expose that tentative preference to a double-blind listening test. Ill put it this way: With my current reference system, I could coexist with the Bel Canto e.One Dac3 in total happiness. Im the guy who, still to my own amazement, prefers a pair of tiny, relatively inexpensive digital amps to two huge superstars I couldnt get rid of fast enough: the Mark Levinson No.33Hs. The Dac3 is in that Mighty Mouse league -- though, of course, the Integris CDP remains as a cherished resident. Its a pleasure to praise a significant accomplishment. Bel Canto Designs e.One Dac3 is a peach of a product.